The act of writing is actually preceded by a blankness, a set of empty moments, in which nothing is already known. I'd like to make a case for seeing the prewriting phase as a preverbal moment and a vote for facing emptiness, the nonverbal, that absence of words that occurs before writing starts to appear. In process pedagogy, prewriting usually refers to the notes, freewriting, brainstorming, and research a writer might do before starting a first draft. Don Murray described prewriting as "everything that takes place before the first draft"; D. Gordon Rohman defined prewriting as the "point where the 'writing idea' is ready for the words and page." What I'd like to talk about is how prewriting (pre--as in what comes before writing) is nonverbal, and all those other activities are already writing. The act of writing is actually preceded by a blankness, a set of empty moments, in which nothing is already known. It is a pre-pre process and the wordlessness that is necessary for the verbal. It's the big mind described by Suzuki in Zen Mind, Beginner's Mind. 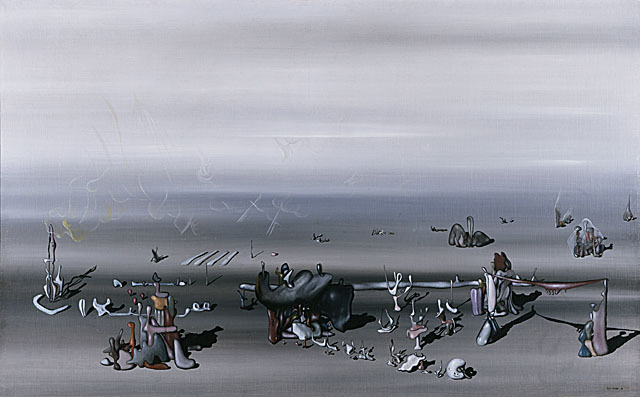 The terrain of prewriting is like a Yves Tanguy painting: at first, a sense of a place without details, as though all detail had been razed. It's the hunting grounds, home court, and head quarters of the unconscious. Then as you contemplate this emptiness hints and form and wisps of voice begin to appear. Prewriting refers to the contemplation of the emptiness before language rushes in; a preverbal state of writing is expansive with no decisions yet made about style, content, or possibly genre. It’s Emily Dickinson’s dwelling in Possibility. It's what happens before the "commitment" of writing, to use Don Murray's wise name for a piece of writing. People have different terms too for that observation of emptiness. James Moffett (an incredibly interesting and currently under-read composition scholar) called it "suspending inner speech." I’ll call this emptiness of prewriting formlessness. The benefits of formlessness include fewer preconceptions about how and what one should write (or what one is good at writing), leading to a wider horizon. By staying with formlessness, especially if you are a student or professional writer with a declared genre, you can discover far more than an idea for a single story, poem, play, etc. The mindful writer avoids preconceptions of genre, process, content, and audience. All writing is thus preverbal. All writing is built on emptiness, and that emptiness is preverbal. A mindful writer is alert to this blankness. He or she perches before the brink of unknowing as though patiently ice-fishing in an all-white tundra. It means sitting before one’s own silence and one’s non-writing. The writer knows that the blank contains everything needed to write, that the vast emptiness teems with possibilities. This non-knowing needs to be fostered through discipline. A supreme goal of a writing class should be silence and the absence of language. (So let's hear it for a new learning outcome for a syllabus: not doing any writing.) Learning how to not-know may be best practiced through formal seated meditation: to approach each moment with a blank mind, observe the breath. Our breathing is the metronome on the present. Facing the preverbal isn't always easy. Silence can bring out a writer's fears (i.e. : horror that maybe you'll never write/write well again). And one can't predicate how long this phase will go on. School does not prepare writers well for this experience of no-writing. As a result, some writers misconstrue the silence of the preverbal as an indicator of their deficiency and either struggle in a state of doubt or give up altogether. In fact, this gap in writers' training could be the main culprit behind people's writing blocks after they graduate from MFA and PhD programs. * and my own Yoga for Hands (see this blog).